PROSPECT HEIGHTS — That "must try" garlic truffle mayonnaise from the "Saturday Night Live" parody of Bushwick gentrification could become a reality. Gourmet mayo company Empire Mayonnaise, which had its Prospect Heights storefront used for the viral Kevin Hart skit that aired last Saturday, doesn't actually sell the garlic truffle mayo mentioned in the bit. But co-owner Elizabeth Valleau said the company might just make a limited edition jar of the dressing as a joke inspired by the SNL skit. "It would be amazing," said Valleau, who is also in the electronic group Wolvves. "We've mixed our roasted garlic with our truffle before, and it's been good." SNL's parody of gentrification in Bushwick references an artisanal mayonnaise shop called "Martha's Mayo," where the garlic truffle mayo was a "must try" and cost $8. The show used Empire Mayonnaise, a 4-year-old shop at 564 Vanderbilt Ave. that doubles as a production facility for the mayo it sells in stores around the world. Valleau wasn't offended by SNL making fun of her specialty mayonnaise company. She thought it was funny, and she's used to Empire getting teased. It may seem "silly" to have a store that only sells mayo, she said, but it's not silly to have a mayonnaise company that produced more than 60,000 jars last year and has doubled production every year since it started. 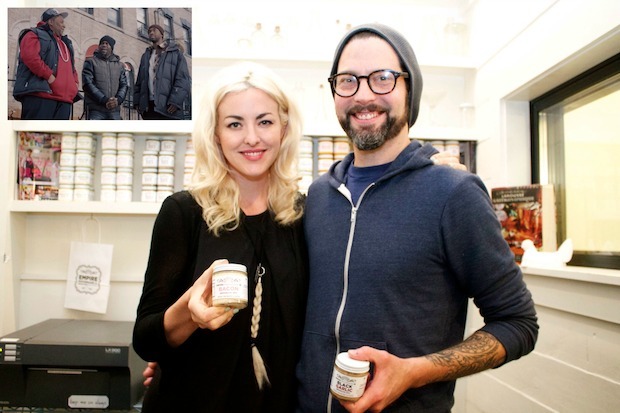 Empire's wholesale business, she explained, is based in the store's 300-square-foot space. "They just don’t understand what we’re doing," Valleau said. "Calling it a mayo store rather than a production facility is a misunderstanding." Like Martha's Mayo in the SNL skit, Empire's gourmet jars don't come cheap. A 4-ounce "classic" jar costs $5, while a jar of white truffle mayo costs $8. Unlike flavored mayos made by home cooks, Empire uses a cold press oil infusion process that flavors the mayo. The result is a smooth, "really, really bright flavor" — not chunky, Valleau said. "Once you try it, it’s transformative," she said. "It’s really, really a very special product. It doesn’t taste like anything else on the market." Hart joked at the end of the SNL skit that he wouldn't pay $8 for a jar of mayo, calling it ridiculous — indicating that expensive gourmet mayo was a sign of the gentrifying neighborhood. But Valleau said Empire Mayonnaise is "no joke." The company is a small but growing family business that pays decent wages and employs native New Yorkers, including her and her brothers. "Most of my team grew up in lower income families, myself included," she said. "This is not gentrification — no one is getting rich here. This is hard work. This is the dream." Try to infuse a light-bodied olive oil with shaved or chopped truffles and minced garlic for about three to five days in the fridge. Then strain and emulsify your mayo. Valleau also suggests keeping "all the good stuff" from straining the mixture for cooking with, instead of throwing it away. "We use humanely raised chicken yolks only, which was my mother's recipe for the densest, creamiest mayo," Valleau said.